Though Apple Chief Executive Tim Cook said this week he'd like his company's products to be made in the U.S., a new report suggests the roadblocks might be too great for Apple to overcome, at least in the short term. Unnamed sources in Apple's upstream supply chain indicated to DigiTimes that moving production lines of Apple products to the U.S. would be a "highly difficult" task for the company in the near future. 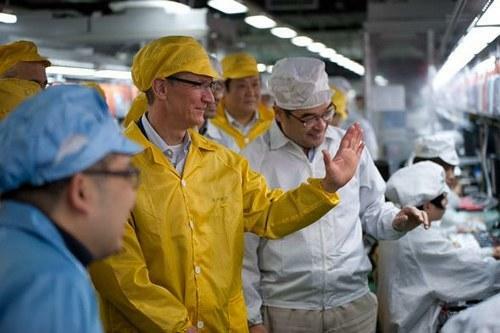 Almost all of Apple's products are currently assembled in Asia before they are shipped to the rest of the world. Even if Apple did decide to conduct assembly in America, the cost to transport components would likely be too high for Apple to bear, the report said. And higher wage rates in the U.S. would also increase costs for Apple. "Since moving a supply chain from one place to another takes time, while enterprises are mainly concerned about costs, if there is no profitability in moving, the related upstream component makers are unlikely to follow Apple in moving to the U.S.," the report said. Almost all of the components Apple utilizes in its products are built in China, proximity to those component suppliers provides more than just cost savings. The New York Times noted in a profile on Apple's supply chain in January that there are a plethora of highly skilled workers, which offers "breathtaking" speed and flexibility that could not be matched by an American plant. Cook was asked about the prospect of building Apple products in America during an interview at the D10 conference earlier this week, where AppleInsider was in attendance. Cook said he would like for Apple to begin building products in America as it once did. Cook did note that the custom-made ARM processors for the iPhone and iPad are built in the U.S., in Austin Texas, while Corning's Gorilla Glass used on the iPhone is made in Kentucky. "There's an intense focus on the final assembly. Could that be done in the U.S.? I sure hope so," Cook said. "But look, how many tool-and-die makers do you know in America? I could ask them, nationwide, to come here tonight and we couldn't fill [a few hundred seats in] this room." While most of Apple's assembly remains in Asia, a limited number of devices have been produced by the company through its manufacturing partner, Foxconn, in Brazil. The Brazilian government granted Foxconn a series of tax breaks to incentivize production of devices like the iPhone and iPad in their country. So far, devices built in Brazil have only been sold by Apple in that country.